$380 for up 4 hours. $450 for up to 8 hours. The First Down inflatable game is a great way to promote exercise, healthy competition and sportsmanship, and is a fun addition to any birthday party or event for guests of any age. 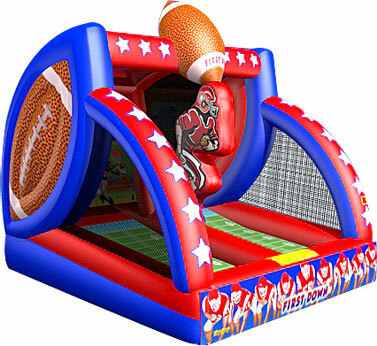 This inflatable football game will attract future football stars to any FEC or outdoor party! Our exclusive line of games are made safe and secure with lite n strong™, fire-resistant vinyl making it safer, portable and more durable.